One of my beloved holidays is just around the corner. It’s the holiday that most children with East and Central Asian ancestry look forward to every year. Lunar New Year! And in case you’re wondering, it’s on February 19th this year. I have the best memories of Lunar New Year. As a child, I would pick out a new outfit for the occasion, help my hard-working mama clean every nook and cranny in our house, and gather at my grandparents’ house with my extended family the night before the big day for a gourmet dinner of endless Chinese dishes. A clean house and food. Both are literally two of my favorite things. Cleaning the entire house is a Chinese New Year tradition, not just one of my mama’s OCD habits. A thoroughly cleansed house is thought to get rid of any lingering bad luck and bring in good luck. If you come across any misfortunes one year, you can probably blame it on the shelf you forgot to dust. We’re all about the good luck and the bad luck! The most exciting custom of Lunar New Year, especially for the kids, is receiving red envelopes from all your relatives. It’s like Halloween, but instead of saying trick-or-treat, you simply wish all a happy new year. Instead of candy, you are handed red envelopes filled with money. When I was young and very naive, I thought I could retire and move to Disneyland with my little haul of red envelopes (this was before I knew what mortgages and bills were). Here’s the catch – once you get married, you stop receiving these coveted red envelopes and have to pay up, i.e. hand out red envelopes to the youngins. What an incentive to be unwedded. 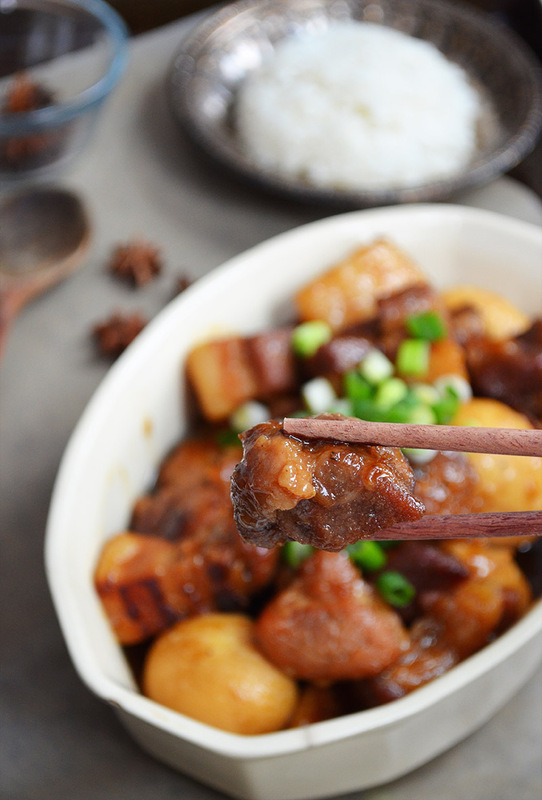 Thit kho tau, or braised pork and eggs in a sweet and sticky sauce, is a Vietnamese dish my mom made all the time for us as kids. Needless to say, I love it and request it whenever I come home for a visit. Caramelized sugar and light coconut milk or juice are used to create the rich and delicious sauce. 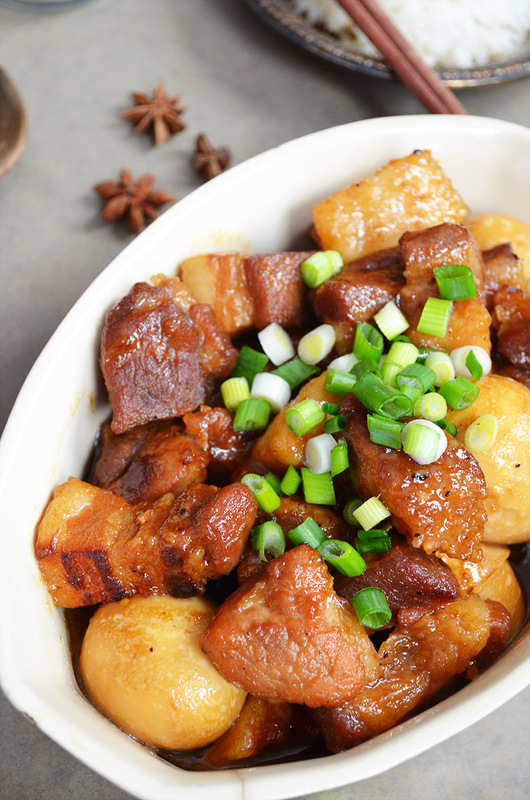 Pork belly or pork shoulder slices are initially coated in soy sauce, fish sauce, star anise, garlic, and shallots, then braised with hard-boiled eggs. 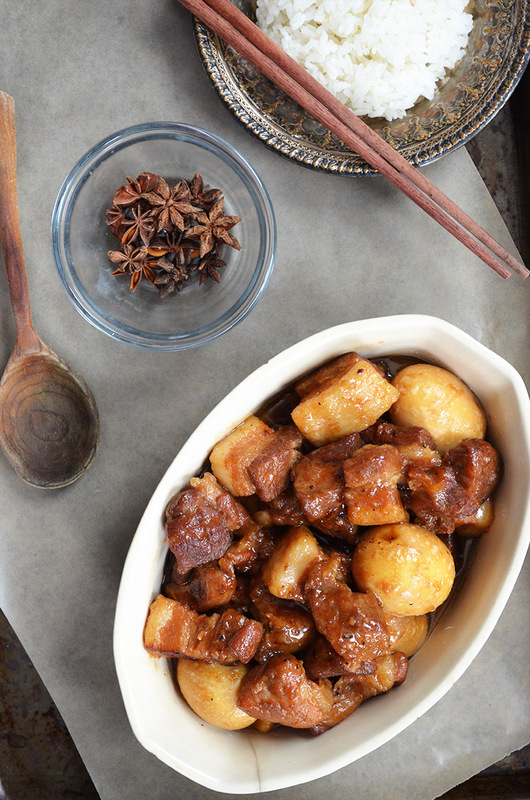 Recently I learned that thit kho tau is a traditional Lunar New Year dish in Vietnam. 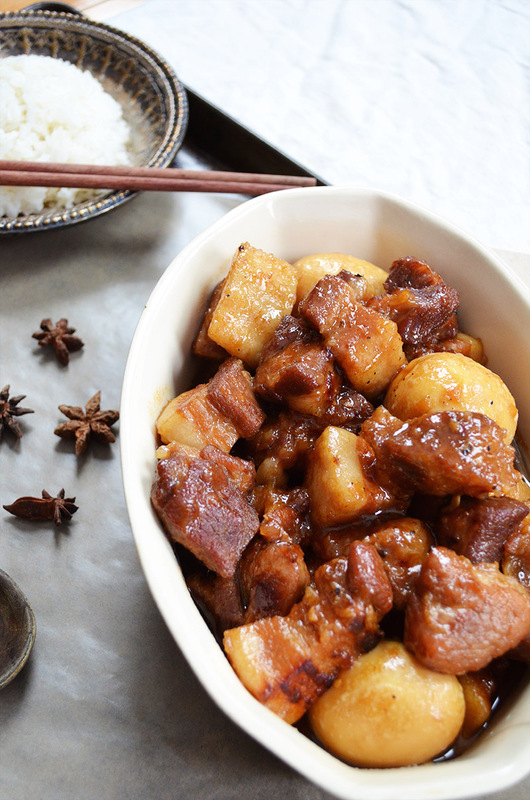 I’m ringing in this Lunar New Year with my own version of this classic Vietnamese dish. Place the eggs in a saucepan and cover with water. Bring the water to a boil. As soon as it reaches a rolling boil, take it off the heat, cover with the lid, and let it sit for 8 minutes. Peel, then set aside. In a large mixing bowl, mix together the pork, garlic, shallots, fish sauce, soy sauce, star anises, and black pepper. Set aside. In a dutch oven or medium-sized pot, heat only the sugar over medium-low heat to caramelize it, about 5 minutes, stirring occasionally. The sugar will melt, turn into a syrup, then become darker in color. The sugar burns very easily so keep a close eye! 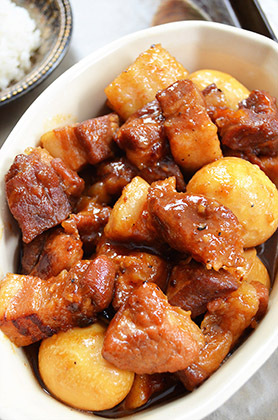 Once it turns golden brown, add the pork, increase the heat to medium-high, and stir to coat and brown the meat. After the meat is brown all over, simmer for 5 minutes to let the sauce cook down. Pour in the coconut milk or juice, bring to a simmer, and cook for 15 minutes, stirring occasionally. At this time, ladle and discard any fat or foam that rises to the surface. Add the peeled and boiled eggs and simmer for 30 minutes on low heat, gently stirring occasionally. 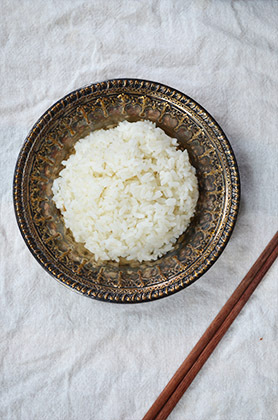 Plate, top with sliced green onions (optional), and serve over rice. This entry was posted in Entrees and tagged braised, eggs, Lunar New Year, pork, pork belly, Vietnamese. looks so good, and such an interesting recipe. Our family enjoys hard boiled eggs so I think this would be a hit. Ladle on the pork & sauce and add an egg to each serving? Thanks, Anna! I think the family would like it too!! The smell can be very pungent, but the taste is awesome. Yes – just ladle pork and an egg over rice to each serving. The sauce will have a lot of fat on the surface from the pork belly, but you can easily remove the fat and serve it over the pork and egg. That’s not really necessary as the pork and egg will be coated in the sauce already and have lots of flavor. I have never had this before!! I’m going to request this at your next visit to SF! I will definitely make this for you during my next visit! 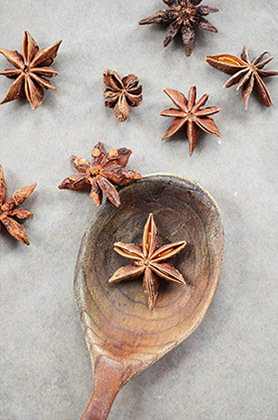 I have heard of this dish before but have yet to make it – it looks delicious! 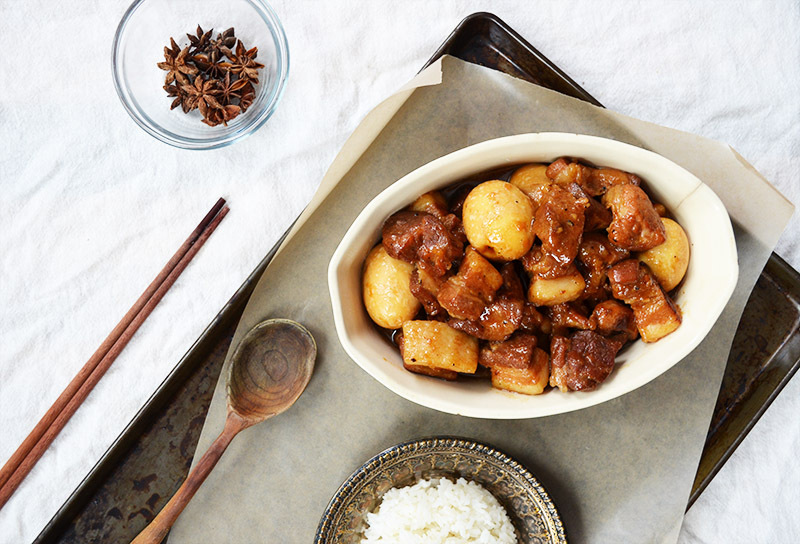 I’ll be trying this next time I can go to the Asian grocery store for some pork belly! Pinned! Thanks Sarah! It’s so rich and so delicious. Also, replacing the eggs with firm tofu might work really well (: Let me know what you think!! I love pork belly too!! (: It’s great in everything! Wow, this dish looks so delicious! I just had a braised pork dish with a poached egg over the top yesterday for the first time and I loved it. I need to make this at home! Thanks, Marcie!! The dish you described sounds delicious! My hubby would love this! Pinning so that I can make it for him soon. How wonderful and interesting! I haven’t really made anything quite like this before, and it looks too tasty not to try! It is seriously one of my favorite dishes ever!! It’s rich and full of flavor (: Please let me know what you think if you try it!! 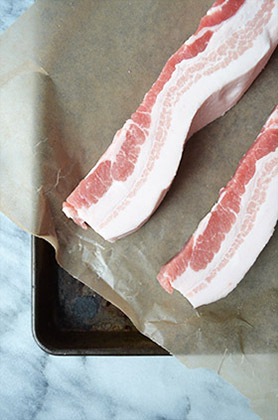 Those inch pieces of pork are just as large as your 1 inch eggs. They must be organic. please tell me where to get them.